The Cedar Creek Brewery has announced plans for a series of special releases in 2014. 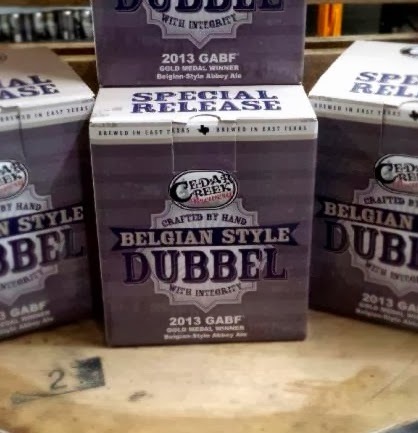 First among these is their Belgian Style Dubbel, which this past October brought home a gold medal from the Great American Beer Festival. Beginning this week, it will be available for a limited time in 4-pack boxes of 16-ounce cans. Subsequent beers in the series will be come out quarterly. Next in line is a chocolate coffee porter brewed with locally-sourced beans from Ennis, to be followed by a saison and an English-style barleywine. Also in the works is a forthcoming year-round offering called Dankosaurus (6.8% ABV, 70 IBUs). Inspired by west coast IPAs, this beer features an experimental hop currently known as "05256". This new variety adds notes of peach, apricot, tangerine and pine, along with an herbal quality. Look for it on tap and in cans sometime late March. The brewery in Seven Points continues to grow in its second year, evidenced by the addition of three 30 bbl fermentation tanks in November. They've also remodeled a portion of their space to accommodate a taproom, which is now open Friday 4-9 p.m., Saturday 12 - 9 p.m. and Sunday 12 - 6 p.m.